The 2015 Near Northside Quality of Life Agreement (QLA) is a comprehensive action plan to build a sustainable and healthy community in the Near Northside neighborhood of Houston that had been neglected for decades. Updated from the original agreement in 2010, the QLA was created through a partnership between the Community Design Resource Center (CDRC) at the University of Houston's Gerald D. Hines College of Architecture and Design and Avenue Community Development Corporation, a nonprofit organization dedicated to building affordable homes and strengthening communities, to address the needs of the predominantly Hispanic neighborhood where one-third of the population lives below the poverty line. The QLA is an action plan designed to improve housing conditions, enhance education opportunities, spur economic growth, and provide a safe and healthy environment for all residents. The CDRC and Avenue worked side by side with residents and stakeholders throughout the yearlong planning process. Taking more than a year to complete, the QLA is a culmination of the sustained contributions of 300 residents, leaders and supporters. It describes a vision for the neighborhood's future, outlining projects, programs, policy recommendations and metrics for measuring the plan's success over the next five years. 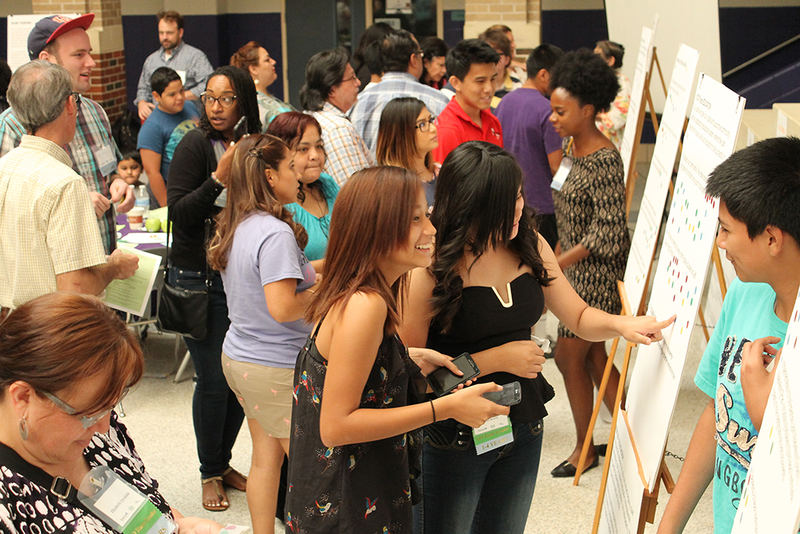 The 2015 Near Northside QLA is presented in both English and Spanish and contains vivid photos and stories to celebrate the accomplishments of the community. Community members review details of the new community plan at an open house. Photo courtesy Avenue CDC and the University of Houston Community Design Resource Center. Avenue provided leadership training to local residents to support their work in resolving the most pressing issues facing their community. Ten resident-led GO (Great Opportunity) Teams addressed specific quality of life issues and interests, including: advocacy and leadership; children, parents and education; culture; economic development; family income; health; housing; safety; neighborhood quality of life; and youth. This organizational strategy has proved a powerful agent of social and community change, one that is flexible, innovative, and responsive to opportunities. By beginning with a commitment to community organizing and shared leadership, a foundation can be built upon which any community can acquire the skills and vision to not just plan for the future but realize their vision. Community residents were invited to share what they loved about their community with hand-written notes on heart-shaped slips of paper. Photo courtesy Avenue CDC and the University of Houston Community Design Resource Center. 264 partner organizations and agencies provided their expertise. Driven by the vision of stakeholders and partners, the neighborhood continues to move forward toward their shared vision developed in the QLA. The Near Northside effort illustrates that even neighborhoods without great influence or wealth have the capacity to acquire the voice and power to implement great change. 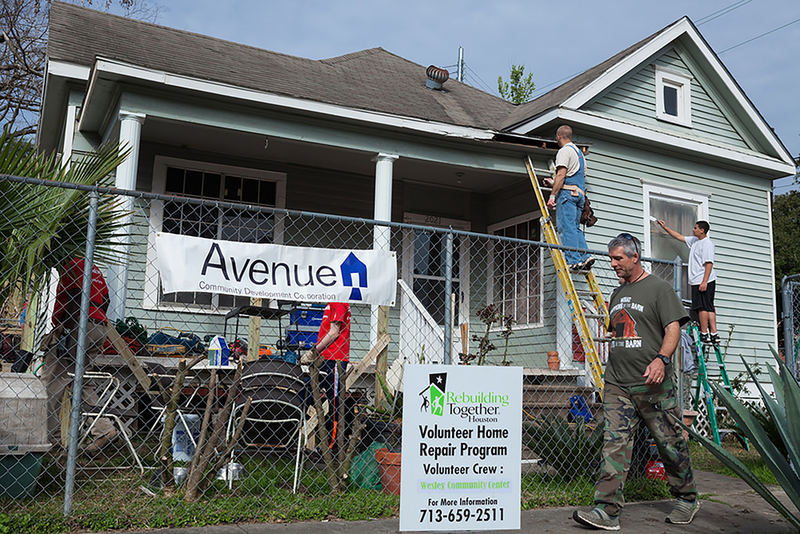 As part of the Rebuilding Together initiative, volunteer crew members work together to renovate a home in the community. Photo courtesy Avenue CDC and the University of Houston Community Design Resource Center.